Old Lexington Club Whiskey Back Bar Decanter. 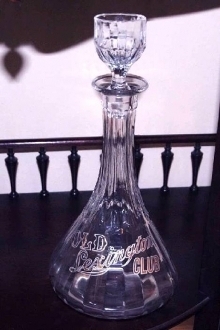 1900's Old Lexington Club Whiskey Decanter. Decanter shaped back bar bottle with gold lettered Old Lexington Club. Glass stopper shaped as shot glass for measurement to pour. Very unique item!